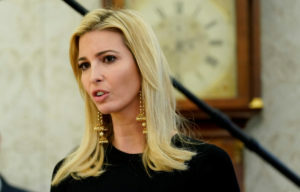 WASHINGTON — An ethics watchdog group asked the Justice Department on Friday to investigate whether President Donald Trump’s daughter Ivanka violated federal conflict-of-interest law by promoting an Opportunity Zone tax break program from which she could potentially benefit. The AP found that Trump and her husband Jared Kushner, both White House advisers, could benefit from the Opportunity Zones program they pushed. The AP report noted that Ivanka Trump publicly promoted the program and coordinated with its main congressional sponsor, Republican Sen. Tim Scott of South Carolina. President Trump lauded his daughter last February for “pushing this very hard.” Hours after the AP story ran last month, Ivanka Trump tweeted her public support for Opportunity Zones and appeared at a White House event promoting the program. AP reported that Kushner also backed the program, but had more limited involvement behind the scenes. A spokesman for Abbe Lowell, the couple’s ethics lawyer, dismissed the CREW complaint as “meritless.” Ivanka Trump “adheres to the ethics advice she has received from counsel about what issues she can work on and those to which she is recused,” said the spokesman, Peter Mirijanian. A White House spokesman did not immediately respond to the complaint. Previously, White House spokesman Hogan Gidley said that the Opportunity Zones program aimed “to uplift America’s most distressed communities” and the White House had “nothing to do with” the designations of the zones. The zones, which channel where investments are made, were chosen by state governors and agencies and then approved by Treasury Department officials.